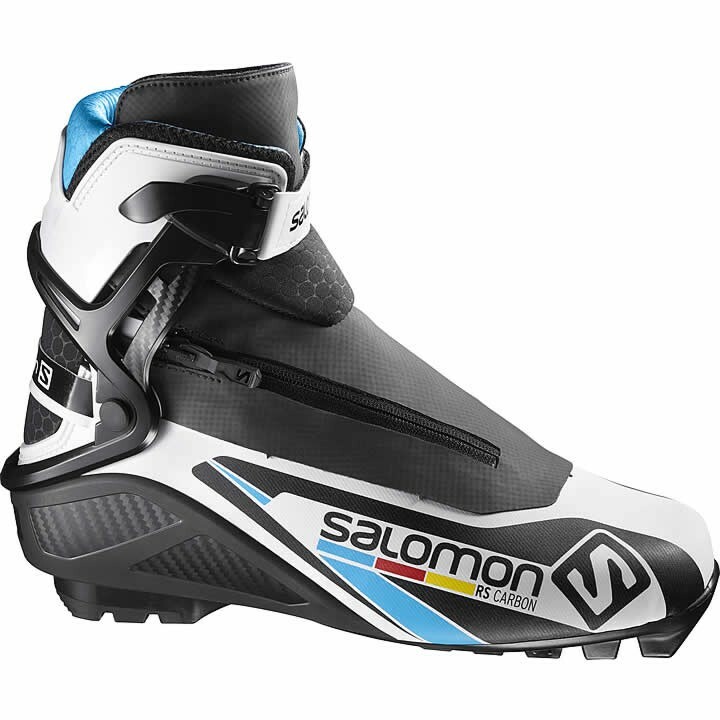 With race proven transmission and lightweight carbon components, along with the Dissociated Lacing System, Custom Fit, and a slightly generous last, the Salomon RS Carbon is the skate race boot chosen by many athletes and club skiers. Skate Pilot: The performance standard for skating and classic racing. Two axes for more control and energy transmission. SNS Pilot 3 Racing Skate: The most advanced sole. Underfoot Technology enables the boot's pivot point to be located 17mm behind the front of the boot and under the foot for the greatest power transmission, immediate control and responsiveness. Buttressing wings stiffen the sole, driving the power into the binding's guide ridge. A clean ridge channel minimizes snow build up. Carbon Skating Plate: Extra light, dynamic, the carbon plate stores energy when flexing and returns it at the end of the kick for more power. It provides unequaled torsional strength for complete transmission. Memo Strap with Click System: Adjustable strap that fits anyone's morphology. Convenient and quick clip system. S-Lab Energyzer Cuff: S-Lab cuff for lateral support. The 3D Energyzer provides better muscle relaxation and faster ski return. Its high lateral and progressive support gives good edge control as well as free ankle motion.